Although the event of this Fourth Sorrow, mentioned in this prayer above, has no specific scriptural reference, it shows up as the Fourth of the Stations of the Cross prayed throughout the year, but especially during Lent. Private revelations, along with words from theologians, give us some moving insights as to what might have been going on in Our Blessed Mother’s mind, in this heartbreaking moment, when as St. Bernard said “the most sorrowful Mother met the most sorrowful Son”! To set this up, keep in mind the horrible scene unfolding before Mary’s eyes. Jesus was heading straight to His death, His sacrifice for us at Calvary for our redemption. He had been kicked, beaten, and scourged so brutally that His entire body was covered with wounds, almost literally from head to toe. (And this was before the Roman prefect Pontius Pilate sent Him to be crucified.) 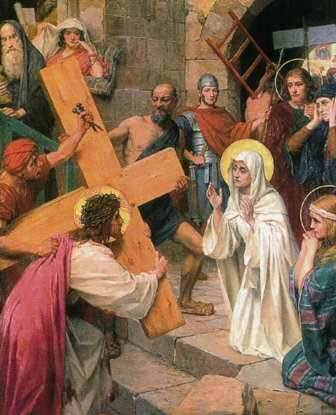 Our Lord was then made to carry the heavy cross on which He was to die, as was common for criminals being given this barbaric form of punishment. Can you imagine such brutal cluelessness and lack of compassion for the One who was all about compassion, and His Blessed Mother? As our Lord said, their sufferings increased greatly just looking at each other in this horrible situation. As we read in St. Alphonus Liguori’s meditation on the Way of the Cross, “Jesus and Mary looked at each other, and their looks became as so many arrows to wound those hearts which loved each other so tenderly.” This scene makes us appreciate even more the sacrifice and sufferings both Mother and Son experienced for our salvation!